The compartmentalization of cyclic adenosine monophosphate (cAMP)-dependent signalling is a prerequisite for numerous cellular processes, including cardiac myocyte contraction and exocytic processes, such as arginine-vasopressin (AVP)-mediated water reabsorption in renal collecting duct principal cells (Beavo and Brunton 2002; Houslay et al. 2005; Beene and Scott 2007; Szaszak et al. 2008). Key players in compartmentalised cAMP signalling are A-kinase-anchoring proteins (AKAPs; see also Dodge-Kafka et al. this volume). They comprise a family of about 50 scaffolding proteins, which form the basis of cAMP-dependent signalling modules at defined cellular sites (Tasken and Aandahl 2004; Wong and Scott, 2004). AKAPs tether the main effector of cAMP, cAMP-dependent protein kinase (protein kinase A, PKA), to cellular compartments, and thereby limit its access to a subset of its substrates. Several AKAPs directly interact with PKA substrates. For example, AKAP18a, also termed AKAP15 or AKAP7a, directly interacts with L-type Ca2+ channels via a C-terminal leucine-zipper motif in cardiac myocytes and thereby facilitates P-adrenoceptor-dependent PKA phosphorylation of this channel. The phosphorylation increases channel open probability, enhances Ca2+ entry into the cytosol and thereby contributes to the P-adrenoceptor-mediated increase in cardiac myocyte contractility (Hulme et al. 2003). The tethering of PKA through AKAPs by itself is not sufficient to compartmentalize and control a cAMP-dependent pathway since cAMP readily diffuses throughout the cell. Therefore, discrete cAMP signalling compartments are only conceivable if this diffusion is limited. Phosphodiesterases (PDE) establish gradients of cAMP by local hydrolysis of the second messenger and thereby terminate PKA activity locally (Lynch et al. 2006; Conti and Beavo 2007). Several AKAPs interact with PDEs and thus play a role at this level of control. For instance, AKAP450, mAKAP and AKAP185 directly interact with PDE4D (Dodge et al. 2001; Tasken et al. 2001; Stefan et al. 2007). The AKAP185-PDE4D interaction, for example, appears to be involved in the control of AVP-mediated water reabsorption in renal collecting duct principal cells (Stefan et al. 2007). AKAPs also bind protein phosphatases dephosphorylating PKA substrates and thereby terminate PKA signalling. Phosphatase 2A (PP2A) is, for instance, bound by mAKAP and dephosphorylates Ca2+-activated Ca2+ release channels (ryanodine receptors type 2, RyR2) in cardiac myocytes. Dephosphorylation decreases channel open probability and contributes to lowering cytosolic Ca2+, which in turn decreases cardiac myocyte contractility (Pare et al. 2005). In addition to PKA, PDEs and protein phosphatases involved in cAMP signalling, AKAPs bind further signalling proteins, including other kinases, such as protein kinases C (PKC) and D (PKD), and other protein phosphatases, such as calcium/calmodulin-dependent phosphatase (calcineurin, protein phosphatase 2B, PP2B) (Carnegie et al. 2004; Oliveria et al. 2007). 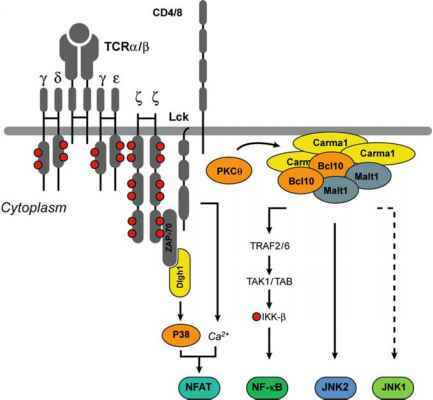 The activation of some of these signalling proteins depends on second messengers other than cAMP, e.g., Ca2+ activating calcineurin and PKC. Some AKAPs possess own catalytic activity, such as Rab32, which functions as an AKAP and possesses GTPase activity (Alto et al. 2002). A prime example of an AKAP integrating cellular signalling is AKAP-Lbc (Diviani et al. 2001). AKAP-Lbc catalyses the exchange of GDP for GTP on the small GTPase Rho through its Rho guanine nucleotide exchange factor (GEF) activity. The active, GTP-bound Rho induces the formation of F-actin-containing stress fibres. An increase of the cAMP level in response to direct activation of adenylyl cyclase with forskolin mediates activation of AKAP-Lbc-bound PKA. PKA in turn phosphorylates AKAP-Lbc. Subsequently, a protein of the 14-3-3 family binds to the phosphorylated site and inhibits the RhoGEF activity (Diviani et al. 2004). Conversely, lysophatidic acid, an agonist stimulating receptors coupled to the G protein G12, increases the RhoGEF activity of AKAP-Lbc (Diviani et al. 2001). In addition, a1-adrenoceptor-mediated activation of G12 with phenyle-phrine increases the RhoGEF activity of AKAP-Lbc in cardiac myocytes by elevating its expression. This causes cardiac myocyte hypertrophy (Appert-Collin et al. 2007).